On January 30, 2014, the Federal Communications Commission (FCC) began the process of converting the entire US public telephone network to all Internet Protocol (IP), which will then transport all voice traffic as VoIP. How long will it take, AT&T has already stopped installing its most popular legacy telephone circuits (referred to as PRIs) in many cities. VoIP or Voice over Internet Protocol allows your business to make telephone calls over the public Internet by converting your voice into a digital signal. Once digitized (turned into ones and zeros), your telephone calls are no longer switched from one telephone to another, but rather are processed by a computer know as a VoIP PBX. The value-added features of VoIP, such as auto attendants and voicemail boxes are now created with individual VoIP PBX computer programs, not by the addition of extra equipment or third party service providers such as after-hours answering services. High-quality German engineered Snom telephone equipment. No upfront equipment, software, or installation cost. Fixed monthly rate with two-year renewable service agreement. No penalty termination with 60-days advanced notice. 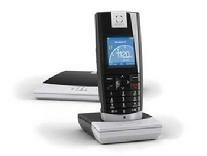 Unlimited local and long-distance calls (US and Canada). Keep your existing telephone numbers. No additional charges to reconfigure features including auto-attendants. 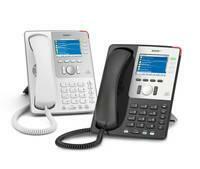 Includes 24x7 support, all maintenance, and defective equipment replacement. Fully programmable hunt groups and auto-attendants. Voicemail, voicemail to smart phones, and voicemail to email. High Definition (HD) broadband audio. 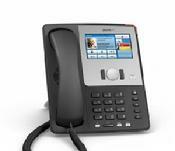 Full integration of smart phones and tablets with your VoIP PBX. Just a few high-quality Snom Telephones. Click on any image for additional information.